Last week was baby girl Aisling 2nd birthday… it goes SO fast! As a family we have decided that we will do something special together or with friends and/or extended families for birthdays instead of gifts. So this year for Aisling we decided to have an open house from 6pm – 9pm on her birthday. We invited 62 people (JUST close friends and family) and of those 43 showed up (in our 500 sq ft main level)! Thankfully it was pretty spread out, but it was still quite a crowd and lots of noise and craziness! At one point there were 10 kids under the age of 5 running around! But we all had a great time! The week leading up to it was busy! I took some of the toys out of the playroom and hid them in rooms to hopefully try and keep the mess to a minimum! I also borrowed a table and chairs from my mom and dad so that the kids had a place to eat and hopefully keep the mess in one central area… it worked! There was food to make, house to clean, decorations to make. It was definitely busy, but I really enjoyed it and the boys were extremely helpful! Early in the week we decided to work on the decorations. I definitely kept it simple. I wanted the (very minimal) theme to be red and white with polka dots or flowers. 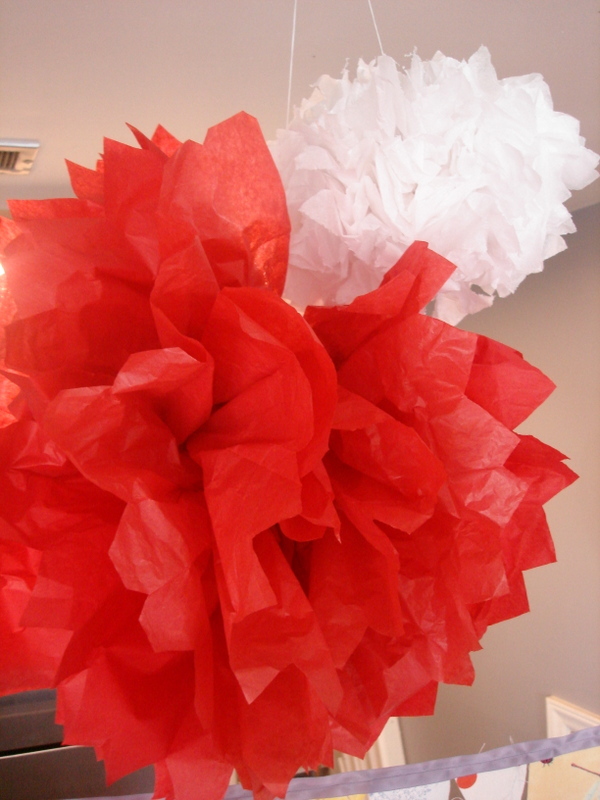 I knew I wanted to make tissue paper flowers to hang from the ceiling over the food area with a simple but fun banner. I didn’t mind if the flowers didn’t last, but I wanted to be able to make a banner that we could re-use year after year. The flowers I had seen online before and knew I’d be able to make it. I found this tutorial on YouTube that was very helpful! We made a large red one and a little white one! I definitely like the white best because I was a little short on the red tissue paper and it wasn’t nearly as full. An added cost saver for these was that I had saved tissue paper from Christmas. It was a little wrinkled, but for this project it didn’t really matter. 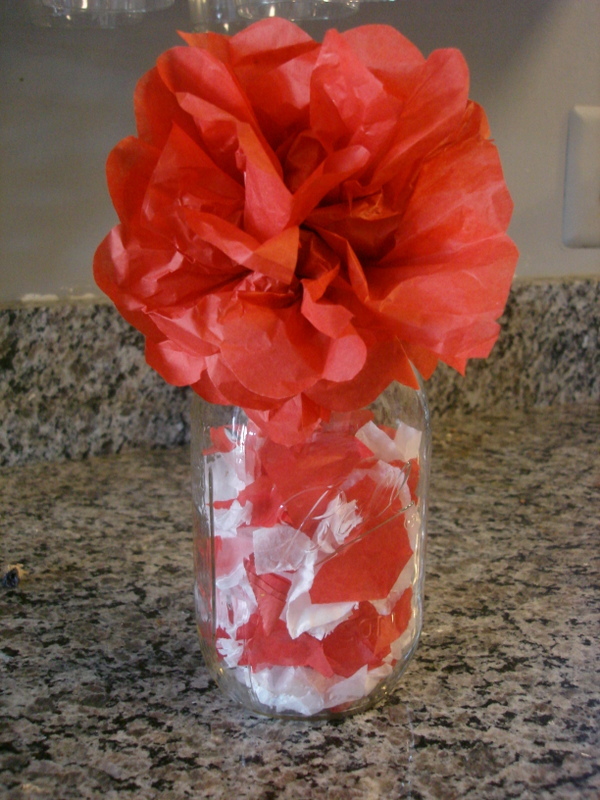 With the leftover scraps I threw them in a jar which looked like red and white confetti and made a smaller flower and attached it to a twig that Koa located and trimmed for me. It went on the table with the cookies! For the banner… I didn’t have any tutorial or instructions, just something I had in mind and wanted to create. I used some ribbon I had on hand and some scrap fabric I also had. 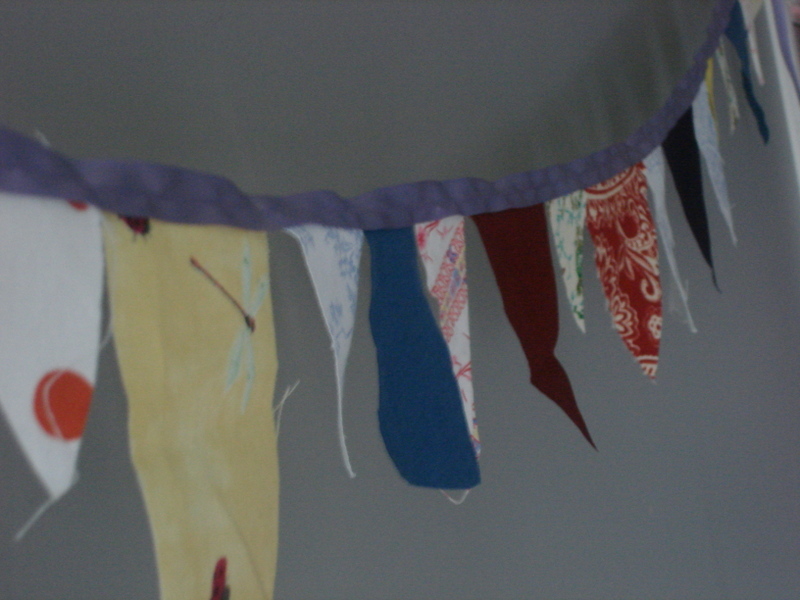 I cut the shapes I wanted and then just sewed them to the ribbon. It took all of an hour or two and it was actually a lot of fun. The boys loved watching and also helped me pick what order the shapes and fabric colors should be arranged. We had coffee, both regular and decaf, hot water for tea, and three types of low allergen (except nuts) desserts. Since my kids obviously have allergies I wanted to avoid those ingredients so they could enjoy the treats as well. There were also two other families who were there who had significant food allergies that I wanted to take into consideration as well. All of the treats were gluten free, dairy free (depending on the type of icing), egg free, and soy free. I definitely didn’t have the time to come up with my own recipes, so I searched until I found recipes that I thought I could change to fit our needs. Thankfully they all worked! All the food was a huge hit even with the traditional sweet eaters! That is a true compliment! 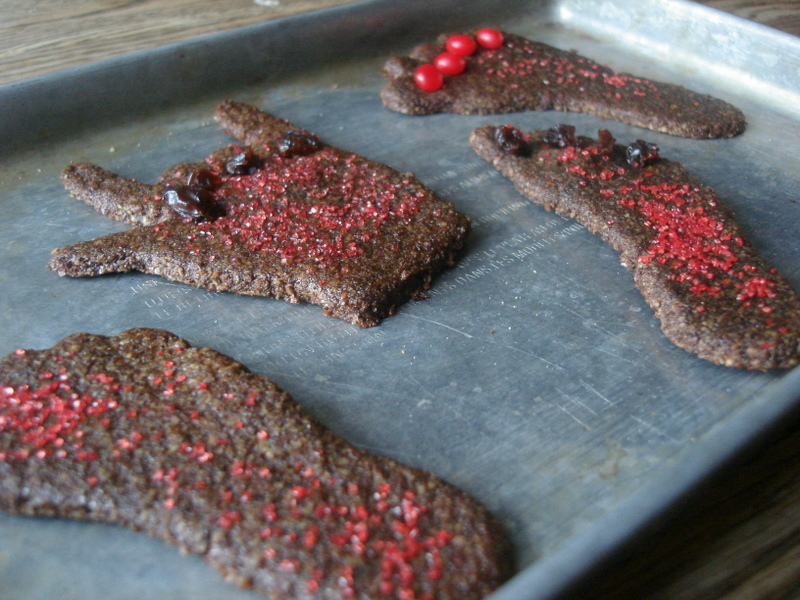 I really like Gingerbread Cookies and I knew the kids would too. I also thought they would have fun cutting them out and decorating them as well. 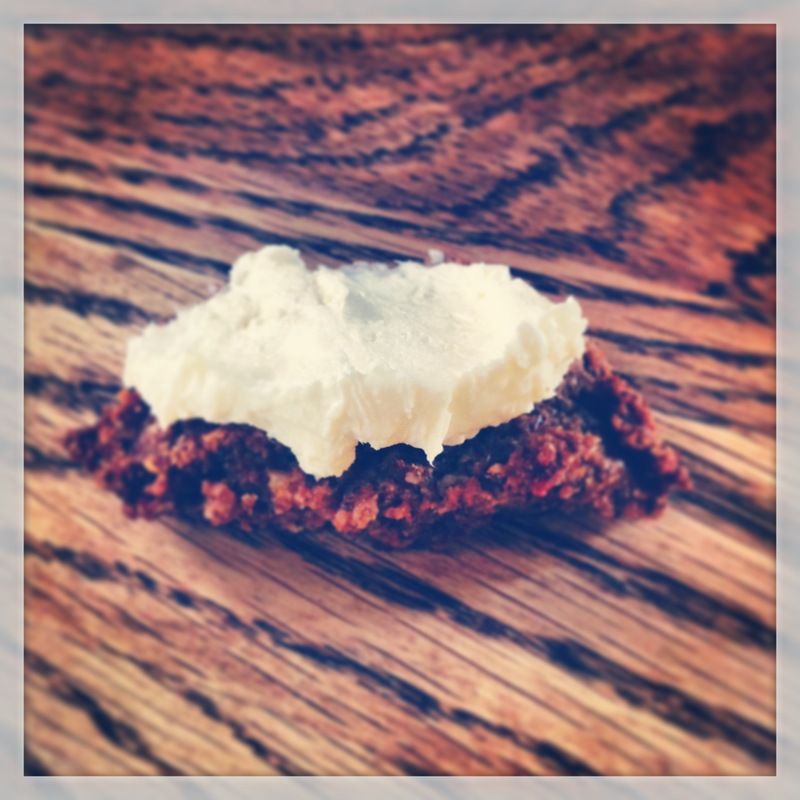 I found the recipe we used on Primal Palate and they were amazing! I did find that in order to decorate them I had to take them out of the oven about 2 minutes before they were done cooking, decorated and then put them back in to finish browning. Otherwise I found the cookies were too hard and the decorations didn’t stick. I also found the dough to be a bit sticky, but after adding a bit more almond flour and making sure the dough was well chilled it worked much better. The link for the recipe is above. I’m not actually posting these recipes since I didn’t come up with them and since I really didn’t alter them much at all. The second type was Pumpkin Woopie Pies from Deliciously Organic. These were the favorite of the evening with the adults. I did follow the recipe except wanted to leave out the eggs for obvious reasons (and there was another family who couldn’t have eggs either). I subbed out the eggs with the flax seed slurry (1 TBSP ground flax seed left to soak for about 5 min in 3 TBSP hot water). In so doing, they needed to cook MUCH longer… almost 25 – 30 minutes and even then were still quite soft in the middle. I also flattened them out to help them cook more thoroughly in the middle. The recipe makes them into pies with the icing in the middle. To make them stretch further I just left them as cookies and put a dollop of icing on top. Mmm… My mouth is watering just thinking about them! The icing with this recipe is just cream cheese, butter, vanilla extract and maple syrup. It was SO SO SO good! But of course my dairy free daughter couldn’t have it, so I made her some cinnamon frosting. It was super simple and quick and she really seemed to like it! 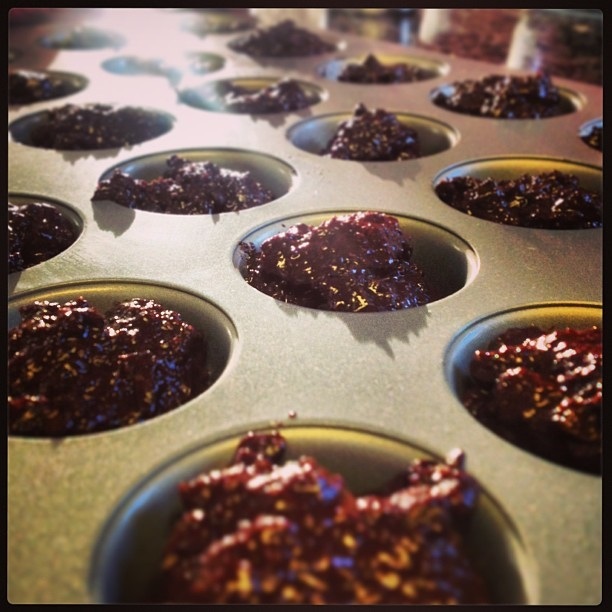 And last but not least, the Mini Paleo Brownie Bites from Clean Food Creative Fitness. These were a large hit with the kids… and not with the adults, because they didn’t get there fast enough! I also used some of the cream cheese icing and put it on top of a few and left a few without! These were firm, dark chocolatey with little chips on the inside! There was one left at the end of the night that Brian and I got to split. I’ll definitely make these again! These two called for eggs and I used the flax seed slurry as a sub and it worked again, but also needed to be cooked quite a bit longer, just like the pumpkin cookies above. I think they baked for about 15-20 minutes instead of the 8 stated in the recipe. A few other thoughts about the evening… it was nice there was no party portion and people were asked not to bring gifts so it really was a time just to enjoy family and friends and some yummy treats! It was also nice that since all the treats were cookies, I just used napkins and didn’t have to worry about plates. I didn’t have enough cloth napkins for everyone, so I regret to say I had to use paper, but that was the only disposable product of the evening! It was a spectacular night! We even had some family stick around after all the kids went to bed! It is definitely to be repeated again next year as long as Aisling wants that for her day! Hope you found some good ideas that will help you simplify and cut back for birthdays which can so easily get out of hand. I’d love to hear what you’ve done to make birthdays special, simple, affordable and enjoyable! I’m so happy you enjoyed my recipe! And knowing they were a hit with the kids is such an honor 😉 Looks like it was a wonderful party! THANK YOU for sharing your recipe!!! !